If you follow along regularly, you know that we host a series called 12 months of sensory dough where we and 12 other bloggers try out a popular dough and present a spin to the recipe. Here at Lemon Lime Adventures, we love science. So, naturally we did a liquid science experiment to prepare for our Cloud Dough. 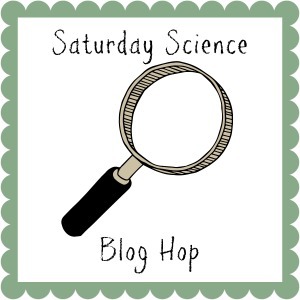 I am so excited to be the newest member of Saturday Science Blog Hop with 3 other amazing blogs. 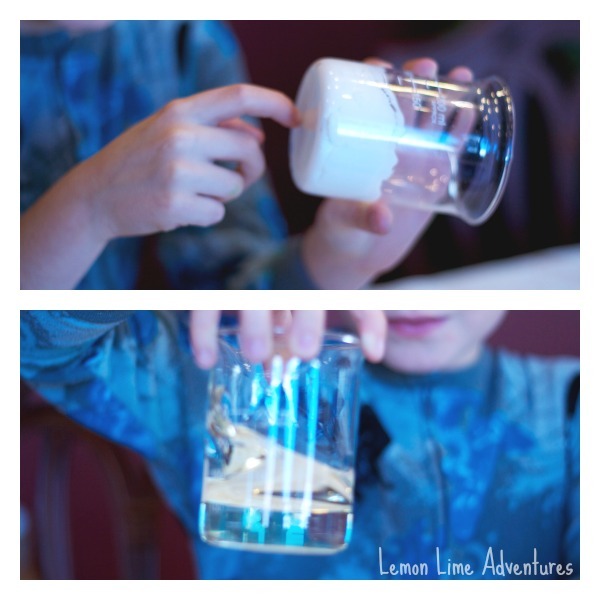 I decided to join along, as motivation to post all the fun science experiments, activities, and learning we are doing each week. 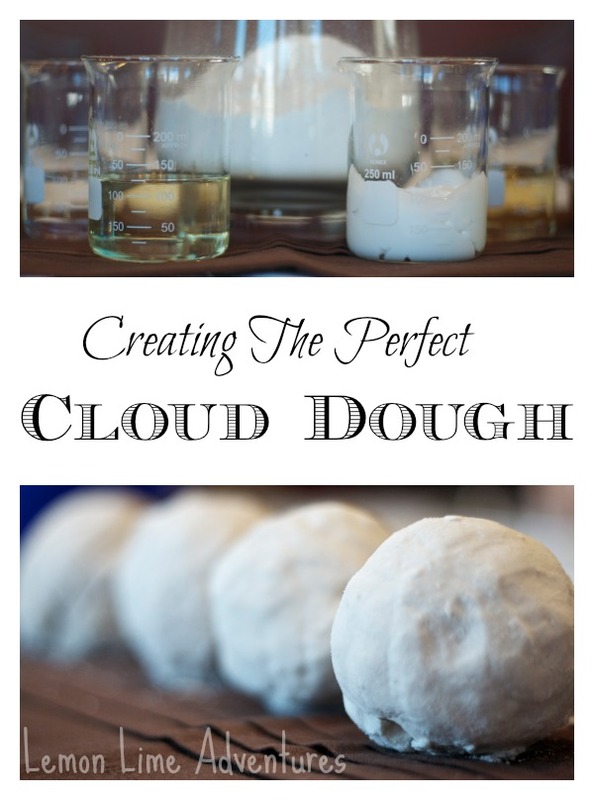 This week I am excited to share our experiment with liquids when we made our recent Cloud Dough recipe. 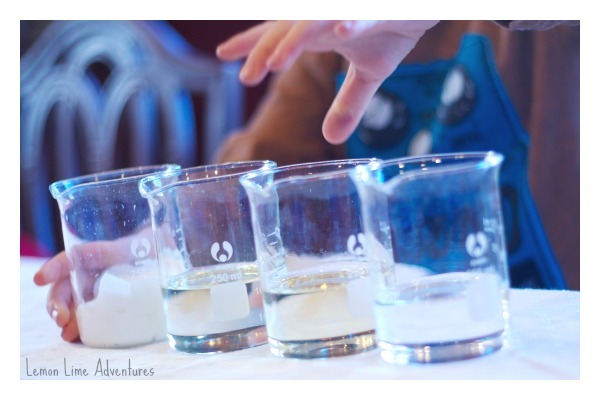 This month our dough experiment was to determine which liquid would be best suited for our Cloud Dough Recipe. 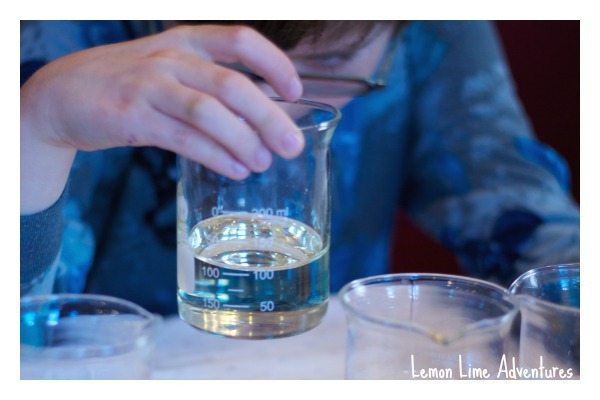 In our liquid science experiment, we talked about variables and constants in experiments. To prepare, I put each liquid in a glass container and set out 4 bowls, hid the containers the liquids came in, and explained the experiment to the children. The vocabulary I focused on was variables, properties, and viscosity. Step One: Explore the various liquids and describe them. We talked about the colors, the thickness, and the ability to see through the liquids. For 10 easy questions to ask during a science exploration, you can read my Getting Started with Science post. 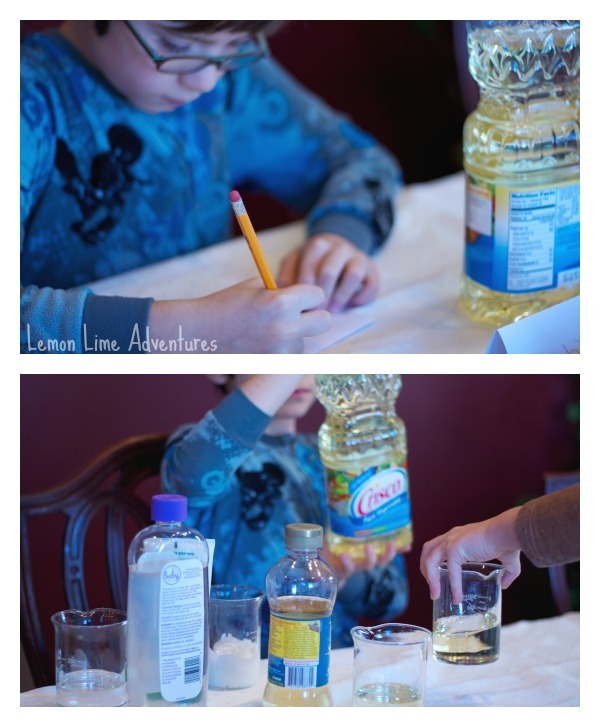 Both boys (age 6 and 8) really wanted to guess the liquids, but at this point I wanted them to focus on describing the properties and comparing each one. Step Two: I introduced our vocabulary. Step Three: Matching liquids to their real world examples. The last stage before experimenting with our liquids was to compare the viscosity of the liquids and order them least to greatest. We did this so that we could determine and predict to outcomes each liquid might have on our Cloud Dough. We made labels for each liquid and predicted how the thickness of the liquid might effect the cloud dough mixtures. Which Liquid Makes the Best Cloud Dough? Finally, we used our liquid science experiment to make our cloud dough recipe. Be sure to read more to find out which liquid worked best! Aren’t you curious which liquid we used to Create the Perfect Cloud Dough? Tip: Don’t let the vocabulary scare you or your kids. I am a strong believer that even children at a very young age can be exposed to academic language and provided hands-on experiences to understand it. This activity would be suitable for children preschool through elementary. The level of guidance and support might need to vary, but science and learning can be fun! 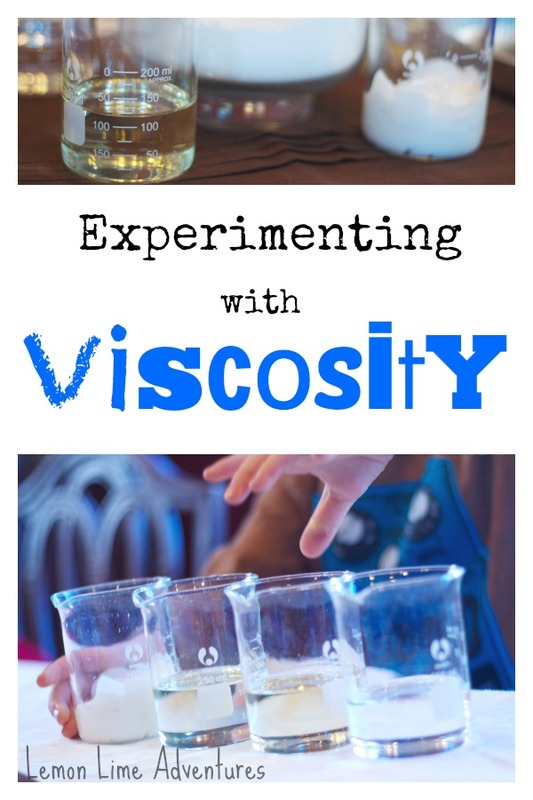 What a fun way to experiment! We’ve never tried cloud dough, but it’s on my to-do list for our next snowy day (which just happens to be very soon!) By the way, welcome to Saturday Science Blog Hop! Happy to have you on board! It is an easy one to make. It is fun to do and change various parts of the recipe. Thank you. We had a lot of fun. Great experiment! I love how you set it up. Thanks for sharing at my STEM Tuesday. As always, thank you for your kind words. Your support means a ton to me! Oh that is so nice of you! Thank you so much. I love the After School Blog Hop and I have not been making it over there! Great science activity! Thank you for linking up to the Thoughtful Spot Weekly Blog Hop!